Ruby definitely falls somewhere in between. Other dogs occasionally react negatively to Ruby. She can be a bit hesitant around other dogs and I think they sense that. And as you mentioned, I know I occasionally become worried when we meet new dogs, which she then senses, etc. I’m sometimes that way too. We always want to have a positive interaction and it’s hard to relax sometimes, especially if the other dog is hyper or approaching fast. We all have certain dogs we like, some that are our best friends, and some we don’t like at all. Mom says it is just like humans…one size does not fit all. Very true, Emma. Sometimes if we just let the dogs decide instead of forcing interactions, we would all have an easier time too. My Sheltie’s reaction to other dogs does not seem to be gender- or breed-specific, nor does it seem to be size-specific. 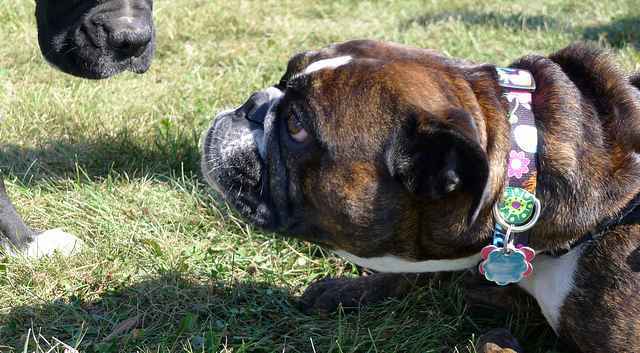 Her vocal reaction to other dogs in outdoor settings is something we work on daily! May I have permission to reblog this post on my own site dogmysteries.com? Full attribution, of course! That’s interesting, Susan. Have you been able to find any other common attributes for the dogs she reacts too? Please, feel free to reblog the post too!? Very interesting read. We are going through some trouble trying to get Arliss to socialize. He doesn’t mind other male dogs, but wants to fight all females to the death. His sister, Lily, gets along with all dogs. Hmm, that’s interesting. Does it matter whether the females are spayed or not? Well, all of them have been spayed. Our vet suggested we try a play date in a neutral location, but even that didn’t work. This is so interesting, thanks for sharing! My Husky, Icy, pretty much loves every other dog she meets & wants to PLAY with them. She tends to be a lot more excitable when meeting other dogs and I think it turns some dogs off, especially older or smaller dogs and those with a low energy level. I’m always looking to match her up with a more active dog. 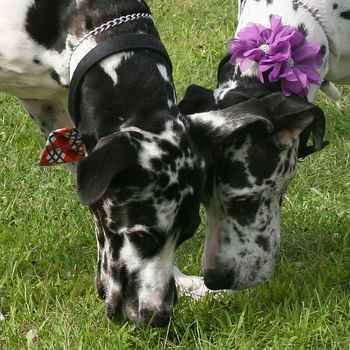 I love that photo of the two spotted dogs, the flower on her collar is so pretty! Sometimes it’s frustrating with an excitable dog, isn’t it? I always love it when we meet a super relaxed dog that doesn’t mind Haley’s energy and they just act indifferent. I think it really helps her to see how they react and she calms down instantly. Those two Great Danes were just adorable!? This was a great post because I have this issue with Dakota. While he DOESN’T like most dogs, he does like some. I always blame myself and I am glad to read that it isn’t necessarily me. The “scent” issue that you mentioned, I found to be of particular interest. I never thought of that before! Thanks! I think the scent issue really comes into play at a distance more than I realized. It’s funny to think how our pups might decide so quickly whether they like another dog. My Cavalier Spencer intensely disliked all big, black dogs. Since I had him from 10 weeks old, and to my knowledge he had never had a bad encounter with a large black dog, I could never figure out why. Something about them just seemed to scare him. On the other hand, he LOVED all other Cavaliers, no matter what their personality. Go figure! I just realized something, Camille. I wonder if a puppy sees a certain type of dog during their fear periods of development, if that could come into play too, especially if the other dog looked big or scary for some reason. 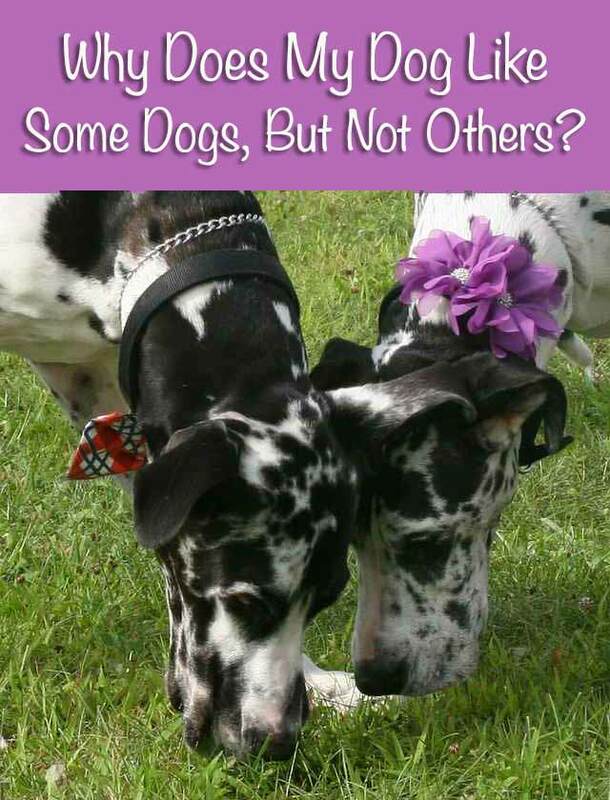 It’s cuckoo to expect event social dogs to like all other dogs equally. Sort of like people who drink “pop” or eat “hoagies” understand each other more quickly than those who use different names. Ah ha, I think you may be onto something there, Pamela! 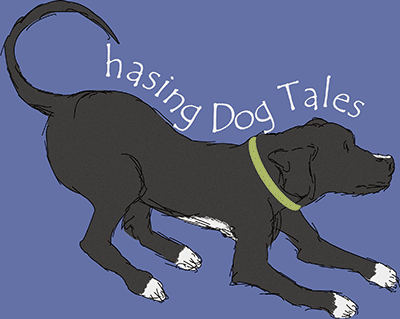 I’ve read that dogs with docked tails sometimes have it a little rougher when interacting with other dogs, since tails are a big part reading intensions and moods. Great point!? I’m originally from Pittsburgh and love it when I come across someone speaking Pittsburghese, lol! Interesting post, Elaine. My golden retriever Savanna usually seems to prefer the company of people. I have only taken her to a dog park one time, but when I did, she went around trying to get attention from all of the people and pretty much ignored the other dogs. Aw, I believe Haley’s the same way, Rachele. She much prefers the company of humans too. Goldens are so loving and sweet! I don’t think I’ve ever met one that didn’t want to greet me in a loving way.? Thanks for this post right now I’m dealing with preacher not liking guilty in my house after preacher got returned to me cuz she didn’t like the dog she moved in with. Oh no, I didn’t realize Preacher came back home. If anyone can get that issue sorted out, it’s got to be you, JoAnn. You’re amazing with your Chessies! ? 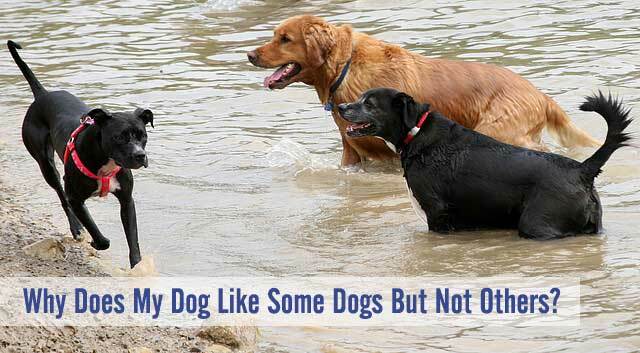 So I totally get this – the doxies really like other doxies which I suppose makes sense. And Sherm and the doxies don’t seem to mind small dogs but any dogs larger than let’s say a Corgi they have an issue with AND Labs, forget it…. That really does make sense and there are a lot of high-energy labs out there so that could be a factor too. A big, excitable dog is a lot of deal with for the little ones. Sam loves everyone and yet there are a few dogs in our neighborhood that go crazy around him and he exhibits a mutual dislike. I believe there is an energy that seeps out that causes kerfuffles. Luckily he shakes it off quickly and goes back to being his sweet silly self. They really do pick up on that energy and you can’t blame Sam at all for not liking those hyper, crazy-acting dogs. Haley’s been put in her place a few times by dogs that didn’t like her excitable energy and it usually calmed her right down, which I appreciated a lot. The owners of the other dogs quickly apologized but assured them now helpful it was that their dogs were teaching mine some manners. It doesn’t always happen that way, but it’s nice when a dog can help another dog, even if there’s a little growling or air-snapping. Liam the pug loved everyone when he was smaller. Seriously, there wasn’t a dog he didn’t like. But as he gets older and a little less steady on his feet, he’s starting to grow selective with his buddies. Rambunctious dogs are OUT! Gentle dogs are IN! That makes total sense, Jean. I guess we people are the same way too. As we get older, we like it a little quieter and calmer.? Missy & Buzz fall right into that category – they like some dogs, and don’t care at all for others. I’m wondering, do they tend to agree on which dogs they like and which ones they don’t? It’s a daily struggle for us! Just because the Boys are fluffy people with dogs automatically think they want to play. Harley isn’t always interested, and many times when he barks he scares the other human because they weren’t expecting it. I still struggle with dogs I don’t know because of canine viruses. Leo’s death will always make me super cautious. Great post – love that final paragraph – very well written. Thanks, Cathy! I know what you mean about fluffy dogs. I wonder if people think of them as big, lovable teddy bears or something. They are so adorable looking, I guess people have that perception. She gets along with all the other dogs really well, so I don’t know what to do. Should I leave the dog park when they get there? It’s embarrassing and potentially dangerous. It sounds like Rota’s bad experience with the Airedale puppy might have made her reactive to dogs that look (and maybe act) similar. That’s understandable since she got scared and hurt by the first dog. You could try to steer Rota away from the problem dogs and Yo by having her follow you to a different area of the park, but that might not be very easy if she enjoys playing with Yo. You could also try getting her engaged more with you while at the park, like playing with a ball or toy or maybe just walking around to investigate different areas of the park and different dogs. If the dog parks visits are becoming too stressful for you and Rota (or you notice her aggressive behavior is getting worse), it would be better to visit the park at a different time or maybe try a new park if there’s more than one in your area. Sometimes people feel like they’re being rude or might hurt another dog owner’s feelings if they suddenly leave when the other person arrives with their dog, but you have to protect your dog and prevent any long-term aggression issues from developing. Just smile and be friendly, but look out for your dog’s best interests. Thank you for posting this! My male dog, a collie hound mix, is about 11 months old, and we adopted him at 8 months. At first he got along with all dogs, now in the past 3 weeks or so he is having trouble with only certain dogs and is very vocal about his dislike. Occasionally not just barking, but also growling and barring teeth. He mostly does not get along with other male dogs, but when he is at doggy daycare I am told he gets along with everyone. So I am not sure if this is a protection thing, a on the leash thing (when 99% of it occurs), or a general dislike thing. We are working on learning to ignore and keep walking when we see other dogs unless I specifically have us stop and greet. Along with that we are doing all kinds of other basic training (he had none when we got him), so that we can distract him with more commands when dogs approach. I am hoping to “out grow” this with training! Any help or suggestions are welcomed! Your boy might outgrow this since he’s currently in his adolescent phase but he does sound quite reactive to some dogs when on a leash (barring this teeth and being so vocal). Since he gets along so well with his doggie daycare buddies, I would try to nip this behavior in the bud by using a no-pull type harness instead of a collar and also keep working on the distraction techniques, like having your dog sit and look at you for a super-yummy treat while other dogs are at a distance away where he’s not yet reacting. Then, you can gradually work on reducing the distance until he’s more comfortable and focused on you even when other dogs are close by. It takes some patience as you work at a pace your dog is comfortable with, but it really pays off in the end. We have a 2 year old great pyrenees…got her when she was 7 months old, and she got along with our golden who was 13…and passed away 3 months later from old age. My son adopted a 6 month female lab…(now a year old) and our great pyrenees always plays great together. My oldest son who just moved back with us temporarily has a 2 year old white Alaskan husky, and or great pyrenees growls at her and even picked a fight with her a couple of days ago. I don’t understand why the aggression towards my son’s dog. Sometimes she won’t even come up stairs to bed because she knows my son’s dog is up stairs. I have to call her several times to get her to come up. Don’t know what to do. Would love all dogs to get along and be friends. My female Labrador seems to have a aggressive aid towards large male dogs, we walked around the park meeting dogs (on the lead) all was fine little sniff, then when we sat down a large Rottweiler male appeared behind us and my dog was barking and Brissling, the man with the large dog just stood there telling me my dog was aggressive but normally she is soppy as anything and I ended up taking her away from the situation as she was getting very distressed, maybe sensing my stress aswell. similar thing happened while walking her of the lead and she met a young male Dalmatian she was calmer but he was boisterous and she had a couple of goes at him, just warnings I think. I don’t really know why she is doing this as it has been a recent change in her. My dog seems to be fine once I take her off the leash at the park, but she snaps at every dog walking by when on the leash. She’s picked a couple of little fights with dogs at the park and I notice she is more aggressive to dogs who are not doing anything and just standing there or don’t want to play. It makes her seem like a menace and I get embarrassed taking her to the park when she’s the one causing trouble with dogs who are relaxed and timid. I have 3 Australian Shepherds. My first 1 is 3 and My second one just turned one. We also took in a 3rd who is about 11 mo now and we took him in at 9mo. He grew up in a family with kids, but found out the mom was allergic to him and they had to get rid of him. Anyway, he fit right in with our two! Loves it! He’s been to the dog park and been to friends houses with toys and bones a lot! However, just recently my brother in law got an Aussie puppy. We went over to his house and their puppy growled at our three a little bit and they just backed off and did they’re own thing. This weekend we got together and there was bones and toys involved and he is aggressive towards him now? He’s never been aggressive before. He growls, bears teeth, and lunges after him. This is the only dog I’ve seen him act like this with. Sure our dogs sometimes steal bones and toys from each other, and same when we go to friends houses, but he has never done this. My Aussie mix, is great when meeting new doggy friends.. If anything she is a bit reserved or shy, and tends to mind her own business. However, she has developed a great dislike for the Doberman down the street. She is extremely aggressisve towards him when he is on lead walking past our home. Could it be his dominant posture? We are currently dealing with our normally easy going dog who has decided he HATES a dog we often cross paths with during morning walks. He growls viciously and lunges towards this dog. We walk in a group that usually has 4 to 9 dogs. This is the only dog my dog has reacted to like this. He has been afraid of other dogs and has barked consistently at a few others but I have never seen this level of aggression. It is scary and reminds me that you can never predict how an animal will react. I have an American Staffy (5 mths old). When we’re at the dog park he gets on well with most of the other dogs but yesterday a large german shepherd came in and my dog went right off barking and snarling at the shepherd. Today all was fine until a large rotwellier came in and the same thing happened. Both times we had been there for just over an hour and I was wondering if maybe this was too long for my pup and the new dogs coming in where just too much for him, otherwise I don’t know what the problem was. I have a 15month old male GSD, only neutered in the last few weeks, who gets on with all dogs. Even dogs who sometimes have a problem with others seen to like him, he even managed to make friends with a little spaniel who was afraid of sheps due to a bite. He now plays and runs after my dog. He does, however, take a dislike to certain people. I met two old friends recently and one he licked and loved – the other he backed away when extending a hand etc. Wouldn’t let her near him even after two hours in their company. My dog is very excitable and friendly. Recently male dogs have taken a disliking to him (he is neutered), even when he seemingly doesn’t even notice them they run up to us and growl. I’m wondering if he might be emitting fearfulness as a few weeks ago he met my aunty’s dog who really didn’t like him and he acted with nervous excitement and unfortunately they kept being thrown together. Could this be related? My dog (35KGs and all muscle) gets aggressive when another dog is excited. So far she has instigated 4 attacks on other excited dogs. All I can do it keep her on a short lead and away from other dogs, but I know that is a negative attitude. What can I do? Even in training circumstances she can launch an attack. My dog, who is usually very friendly and happy, growled at another dog today. We walked by the dog two times, once coming and once going. She didn’t growl the first time we passed, just leash-pulled and tried to investigate. The second time she growled. She hasn’t had any bad experiences with other dogs, so I was thinking it was maybe something about the other dog she didn’t like.